Cliff Burton was an American musician, a song-writer and bass guitarist with the thrash metal band Metallica. He was at his peak as a performer when died in a tragic bus accident while on tour. Cliff Burton had a remarkable chart with a stellium of 6 planets in Aquarius. This collection is based around two groups. The Sun / Venus / Jupiter conjunction in the 5th house has to be the most beneficial combination that anyone could wish for creativity. He was an accomplished guitarist with a classical and jazz early training and a variety of influences from southern rock and country to the blues. He played bass guitar and practiced for up to 6 hours a day. He was selected as the ninth greatest bassist of all time in a poll organized by Rolling Stone. The other Aquarius group was a Mars / Saturn / Mercury combination in the 4th house that brought him a great deal of trouble. There are some conjunctions like the Sun and Jupiter that work so well together because the planets are of the similar extrovert, confident natures. Mars and Saturn, on the other hand are complete opposites and when they come together they can cause much frustration. Mars is the active dynamic principle, Saturn is about limitation and restraint. Mars is all go, Saturn is all stop so having the two together is like driving a car with one foot hard down on the accelerator and the other equally firmly on the brake. Not only do you not end up going where you want but you do untold damage to your vehicle. Mercury is also about movement so its placing with the other two just compounds the problem. The thing is that all 6 planets are together in the same sign and so both of these themes would be interwoven throughout Burton’s life. In fact he started playing the bass at age 13, after the death of his brother. His parents quoted him as saying, “I’m going to be the best bassist for my brother.” Pluto was conjunct his Ascendant at the time. At this point we should note the difficult aspects that the Aquarian group of planets receives from the others. The Sun, Venus and Jupiter are opposite Uranus, a classically rebellious aspect, but the real problems come from a T Square. 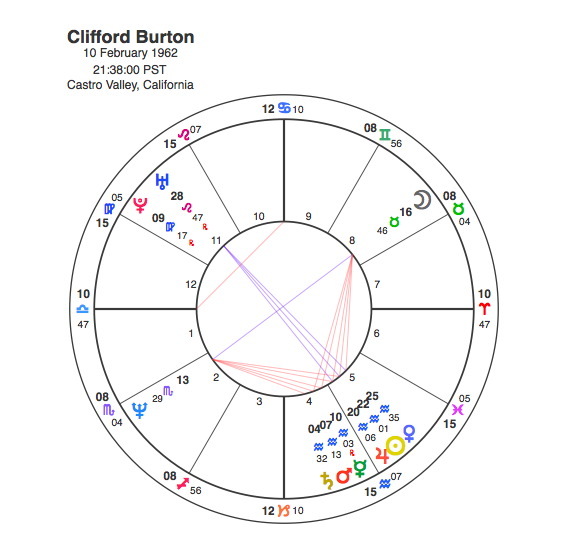 Cliff Burton’s Moon is in Taurus in the 8th house, not such a difficult placing on its own but it is opposite to Neptune in Scorpio and creates an apex with every planet in his Aquarian stellium. The Moon in the 8th opposite Neptune focusing onto Mars and Saturn in the 4th does indicate the profound impact of a death in the family and on his life in general. Because Cliff Burton died so young, Pluto was only able to make two significant aspects in his lifetime. The other important transit was that of Jupiter, a significant member of the Aquarian group. Jupiter was in square aspect to all of his Aquarian planets in 1982 when he joined Metallica. The group’s debut album, Kill ‘Em All, features Burton’s famous solo piece, “(Anesthesia) Pulling Teeth”. His bass playing style was unusual and included the use of a wah-wah pedal, usually the province of lead guitar. His songwriting featured heavily on Metallica’s 2nd and 3rd albums. The question many readers of these pages would be asking is what would happen when Pluto transited to the 6 Aquarian planets. Well the fact is, it didn’t get that far, it made only one aspect to the first pairing, a square to the Mars / Saturn conjunction and that was enough to cause Cliff Burton’s death. In September 1986, the Metallica tour bus skidded off the road, Burton was thrown through the window of the bus, which fell on top of him. One of Cliff Burton’s signature pieces with Metallica was his chromatic intro to “For Whom the Bell Tolls”. An 8th house Moon opposite Neptune and square to an apex Mars / Saturn conjunction meant that when Pluto came into view, it tolled for him.